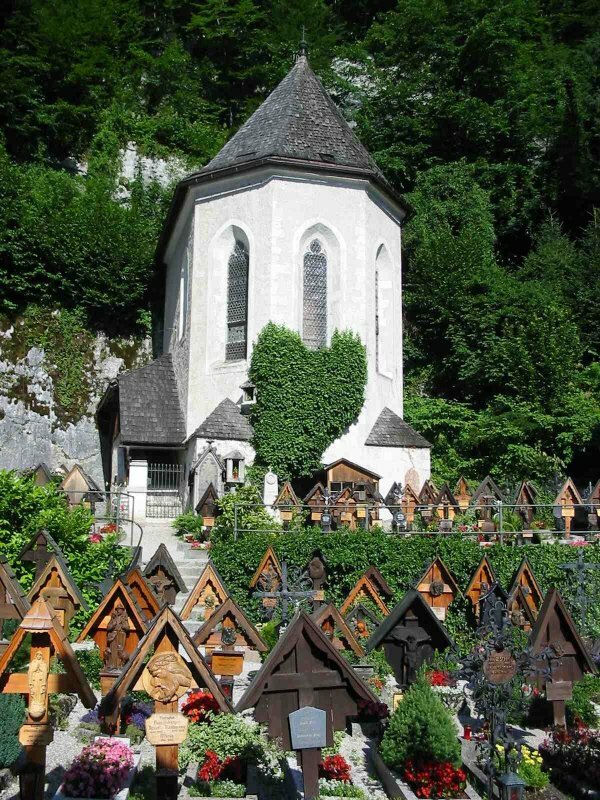 Sights of Hallstatt in Austria: Hallstatt Charnel House. 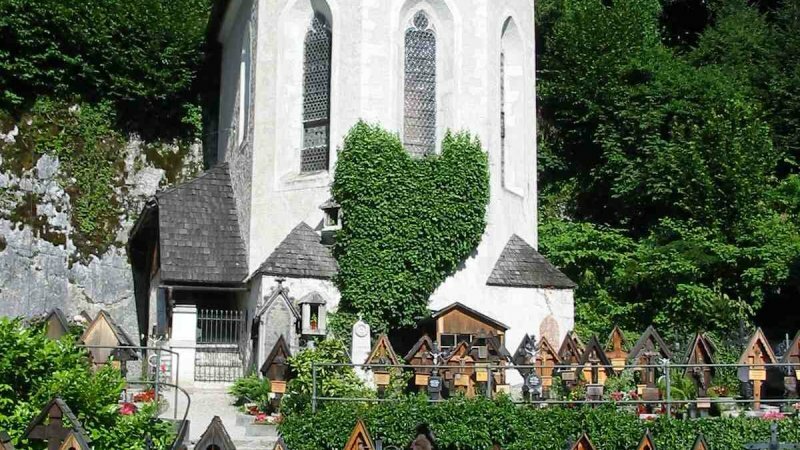 Alongside the world’s oldest salt mine and the idyllic, world-famous postcard view, the charnel house or ‘Bone House’ in St. Michael’s Chapel is one of the most interesting tourist sites in Hallstatt. 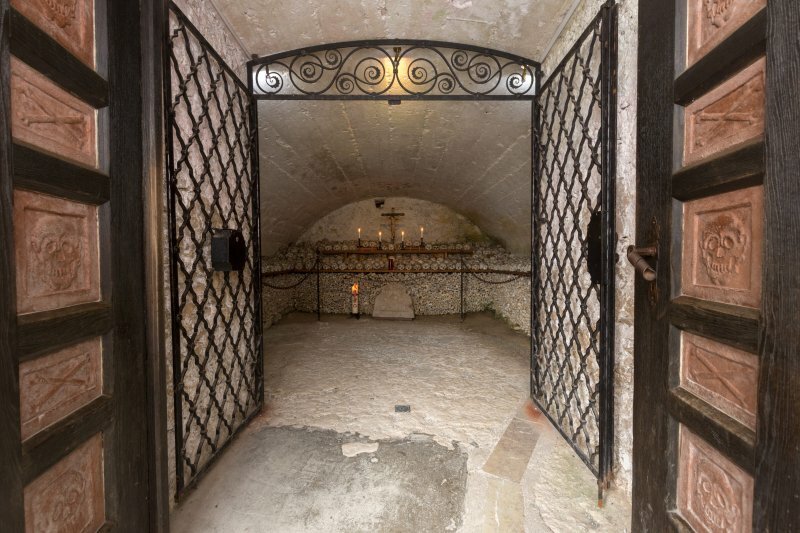 The chapel dates back to the 12th century and is located next to the catholic parish church. 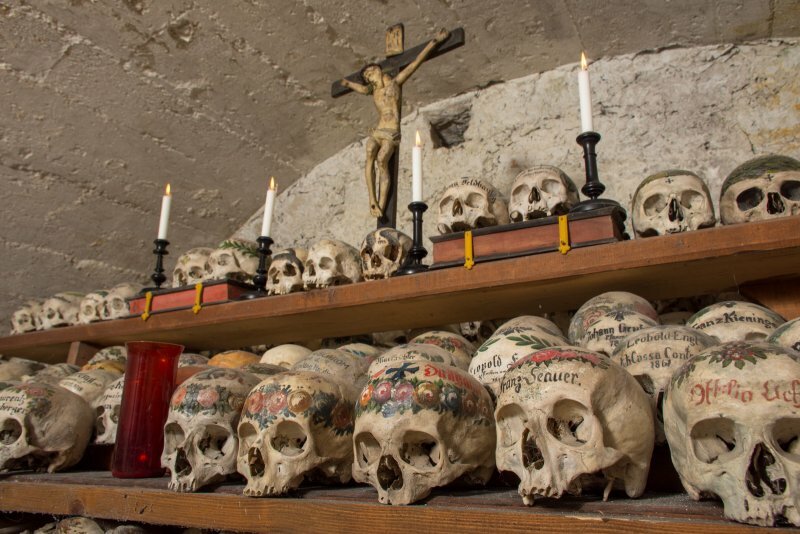 Each year, visitors from throughout the world come to admire the unusual collection of over 600 artistically painted skulls. 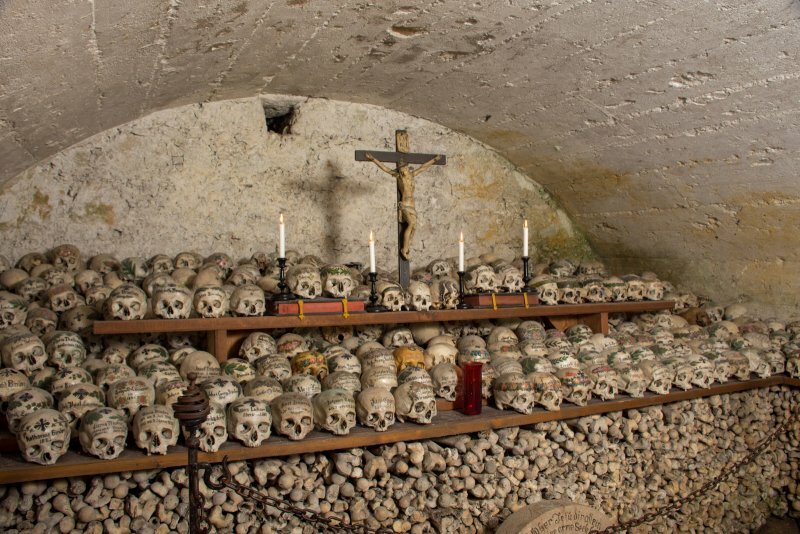 Many of the skulls were decorated at the end of the 18th century, but a few are from even the 20th century. 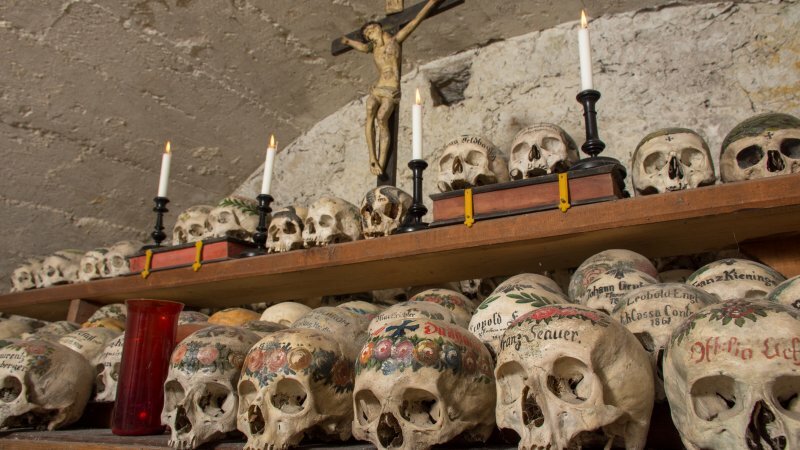 Skull painting was carried out primarily during the 19th century and belonged to a cultural area that mainly consisted of the eastern Alpine region (the Austrian Innviertel, Upper Austria, Salzburg, Tyrol, and Bavaria). Even during modern times, this custom has still been in use in Hallstatt. 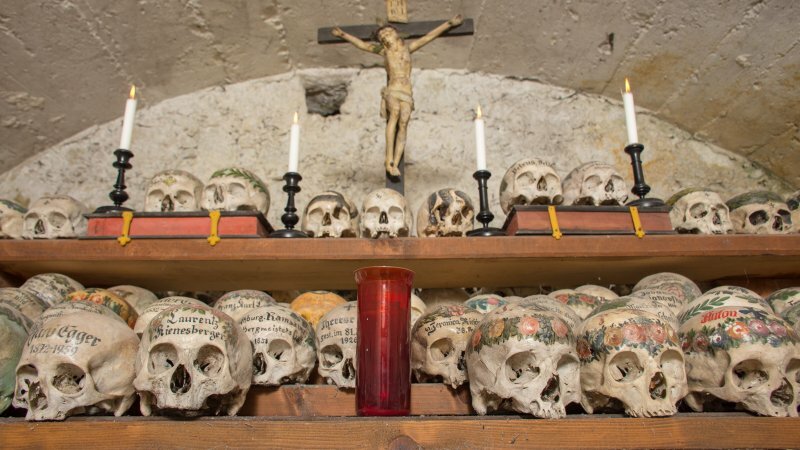 Hallstatt is home to the largest collection of skulls ever, with few other collections still in existence. 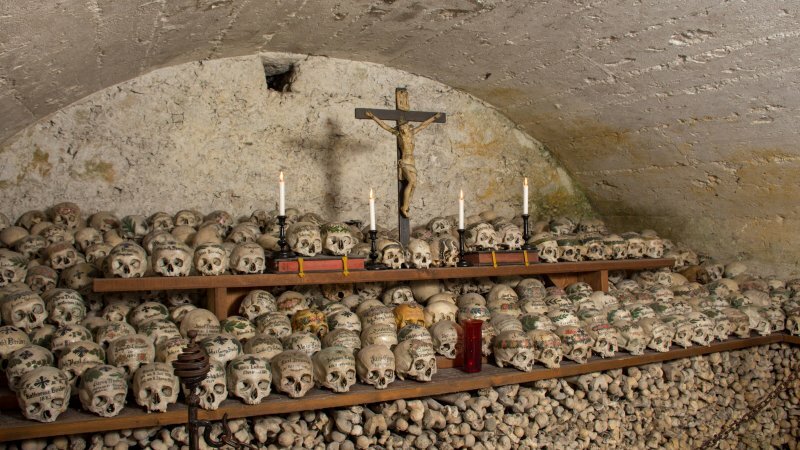 When an existing grave was reused for a new burial, the skull or bones were transferred from the grave to the charnel house or ossuary as part of a second funeral. The identity of the deceased family member was preserved by decorative paintings and inscriptions. 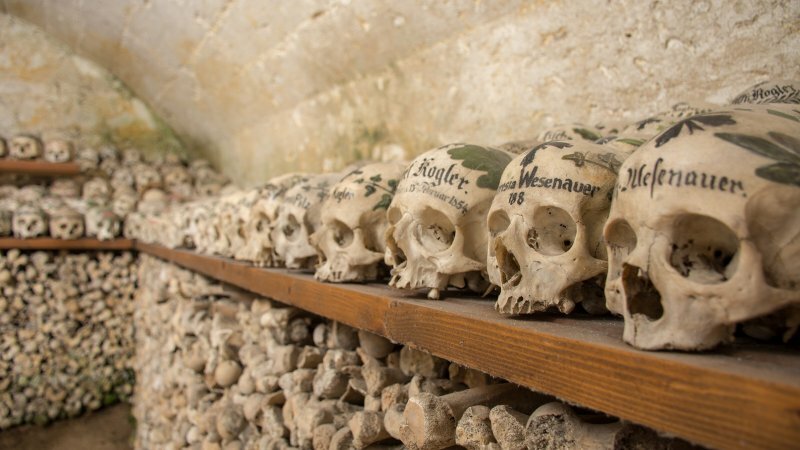 Depending on the family relationship or based on artist choice, the skulls were labelled with names or initials. At times, no markings were used to identify the deceased. Although it is clear that various methods of painting were implemented, there is also evidence that the painting style followed a particular development. This evolution is also apparent in the manner in which the names and initials were written. Prior to a study from 1974 to 1993, there were conceptions regarding the painting which did not correspond with the actual artistic development. 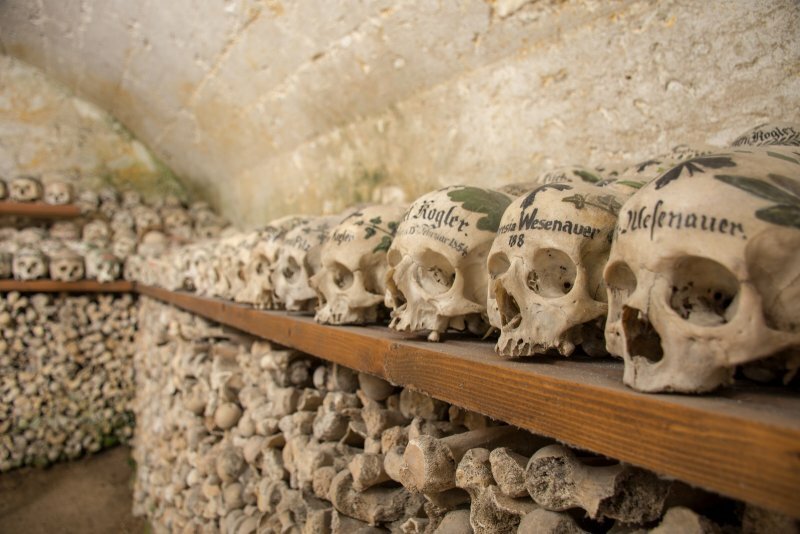 It was also accepted that the skulls had been placed in the charnel house due to a lack of space in the churchyard. 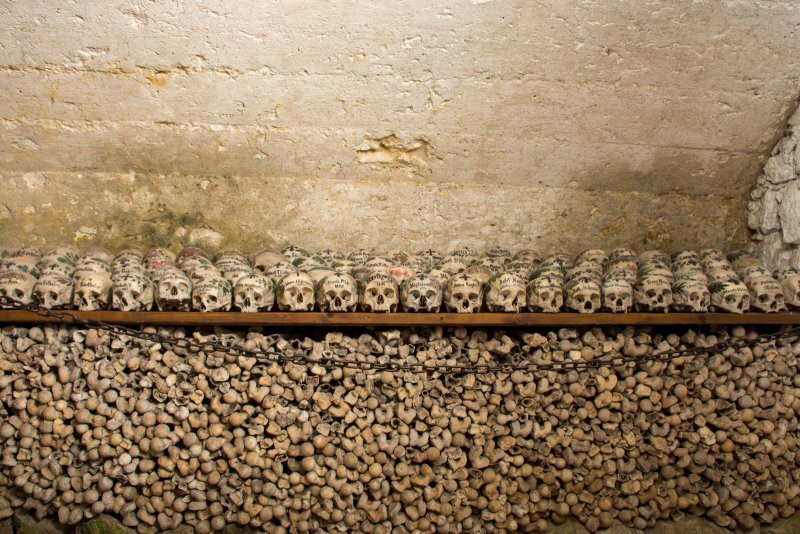 During earlier investigations from 1948 to 1950, 2104 skulls, both painted and unpainted, were documented. 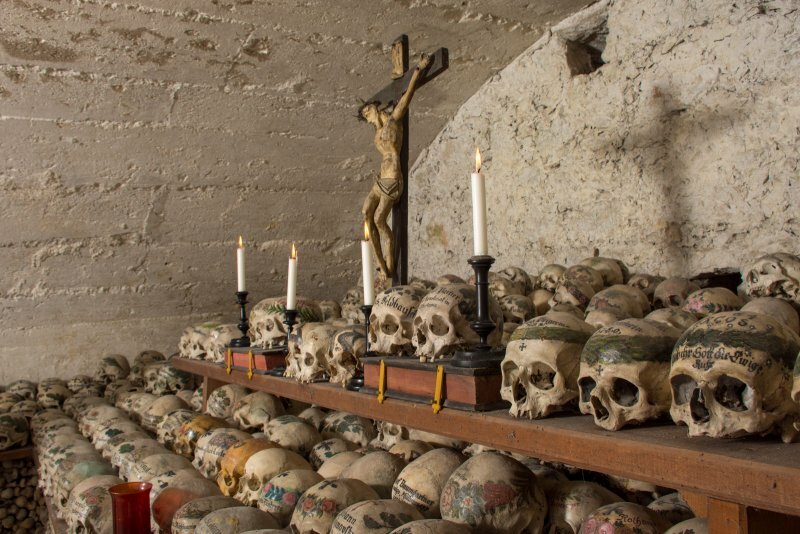 Since there were approximately 30,000 entries in the church death registry prior to 1900, it is clear that the remains of the individuals housed in the charnel house represent only a small fraction of the deceased population. 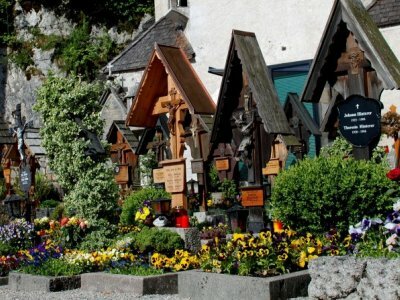 Hallstatt | The cemetery: The rocky grounds of the parish church became the Hallstatt cemetery. The front is assigned the Evangelist Christians. Following the rules of the cemetery there are no family graves. When looking at Hallstatt, you can see how people's beliefs shaped the overall appearance of the World Heritage town. On our 1 ½ hour journey through the picturesque alleys. There is evidence of family tradition in the skull paintings and numerous painters were active during this time period. With few exceptions, certain painting styles emerge as characteristic for particular eras. Skulls with wreaths are the oldest—the darker the wreath, the older the skull. Thin wreaths and coloured crosses with contoured edges are the latest examples of this type of painting. Flower ornamentation on the forehead marks the next phase of artistic development followed by green leaves on the temples (oak, ivy, oleander). A black cross on the forehead was almost always included. 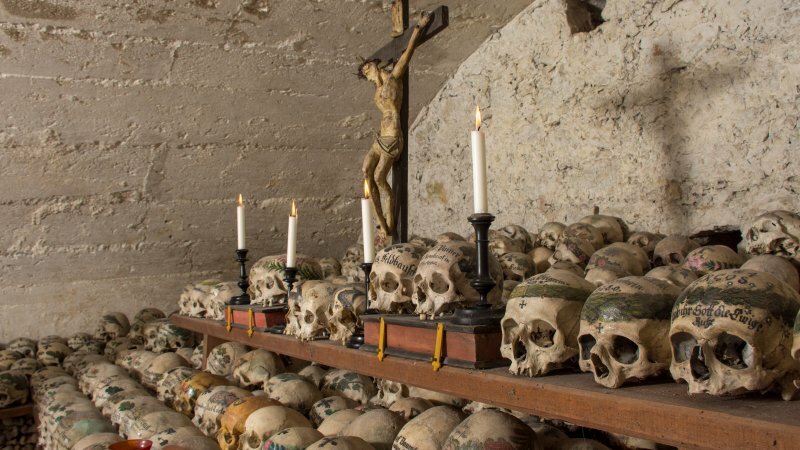 The latest paintings from the beginning of the 19th century are characterized by thin ivy branches on either side of the skull, Latin script and comparatively narrow crosses. At times, skulls only carry the name of the individual. Some paintings are copies of earlier examples. 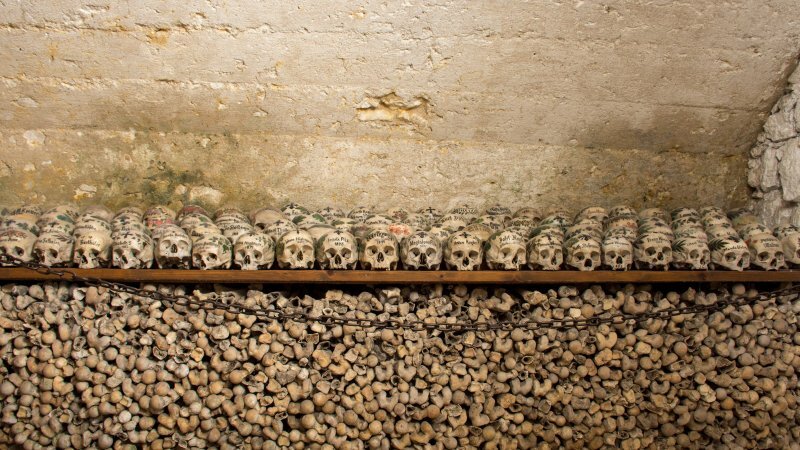 During the last few years of the 20th century, very few skulls were interred in the charnel house. 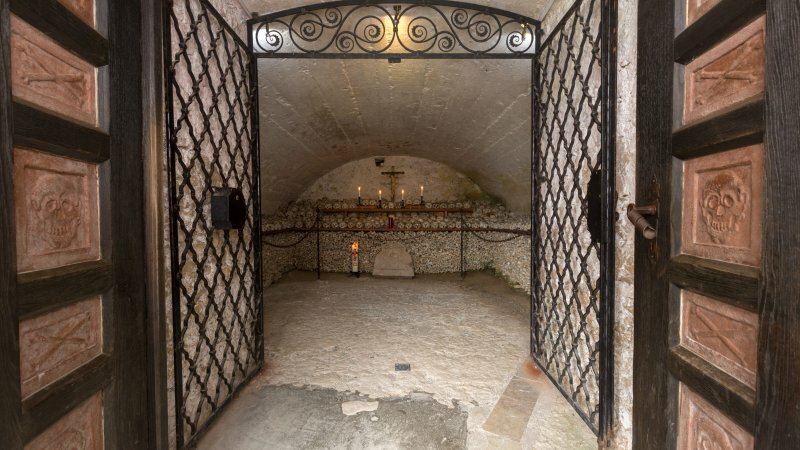 Located adjacent to the picturesque cemetery and next to the catholic parish church, St. Michael’s Chapel is considered the home of the charnel house. Donated by the salt merchant Eysl in 1612, the baroque Michael Altar stands in the eastern section of the chapel. The baroque pulpit located on the northern wall was moved from the parish church in 1905. 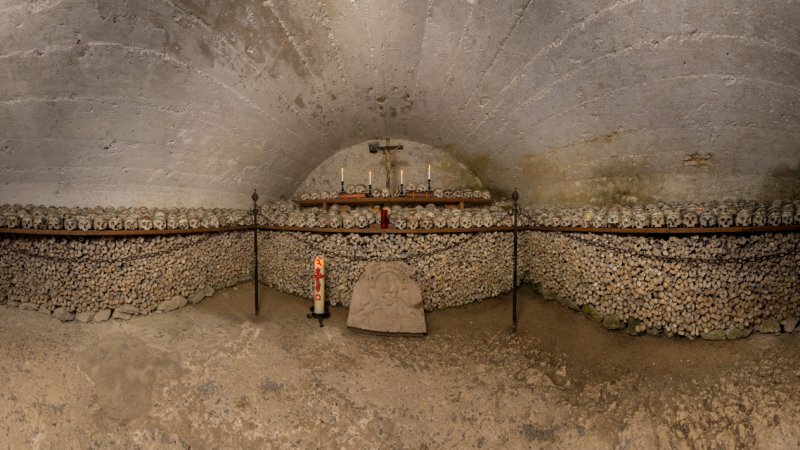 The rear altar originates from the former hospital chapel in the Hallstatt village district of Lahn. The two stone lanterns on the village side were once used during funeral masses. The exquisite stained-glass windows in the gothic section of the chapel, located in the upper story, depict St. Michael with the Balance of Life. 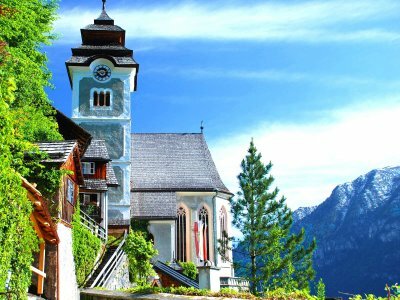 Our Tip: Combine your visit to the historical church grounds with an enjoyable, approximately half-hour stroll over the rooftops of Hallstatt (‘Über den Dächern von Hallstatt’) or along the informative themed path which leads through the entire village center. 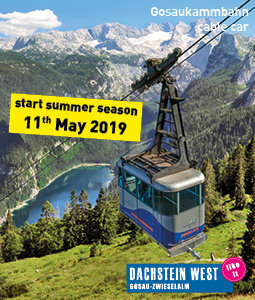 Do you want your family to experience the best attractions that the Dachstein Salzkammergut holiday region has to offer? 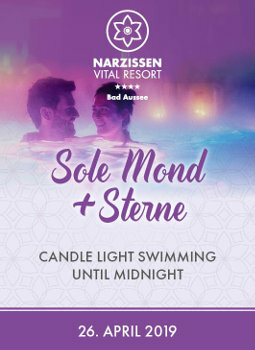 Experience exciting attractions situated between mountains and lakes within the World Heritage region? 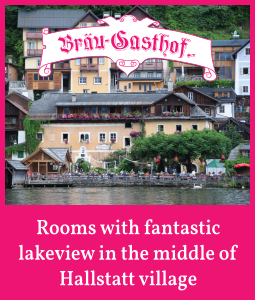 Experience the best highlights of Hallstatt, Gosau, Bad Goisern or Obertraun? 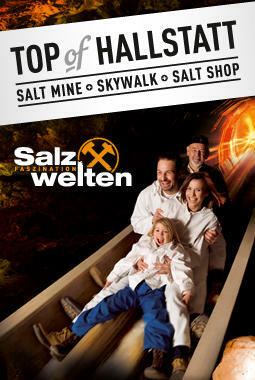 Fantastic fun at a low price await you and your family with three great potential savings: Breathtaking cable car rides, unforgettable cave adventures, perfect bathing fun and countless other recreational activities within the UNESCO World Heritage region of Hallstatt Dachstein Salzkammergut await you. 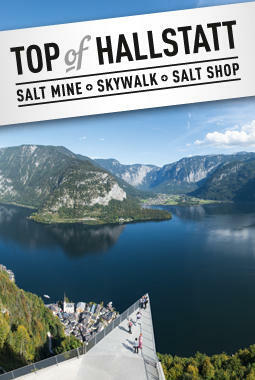 Here you will find all information about the Salzkammergut Adventure Card, the magnificent summit ticket and your personal guest card. 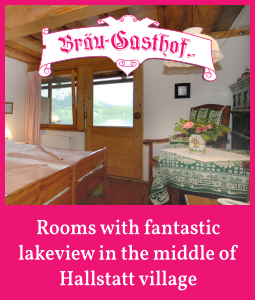 We look forward to meeting you during a fantastic holiday on Lake Hallstatt and in the Gosau Valley. For visiting the catholic church you have to walk on the small hill over stonesteps. 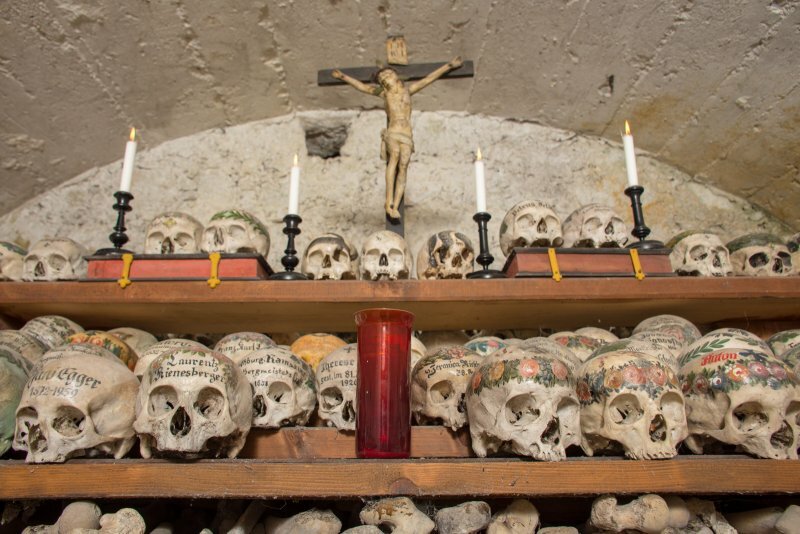 Arriving there you have the possibility to visit the church, the historic bonehouse with over 600 painted skulls and an amazing view over the area and the town.